Transfer to or from the Austin Bergstrom Airport by Limousine with in 15 miles of the Austin Airport. 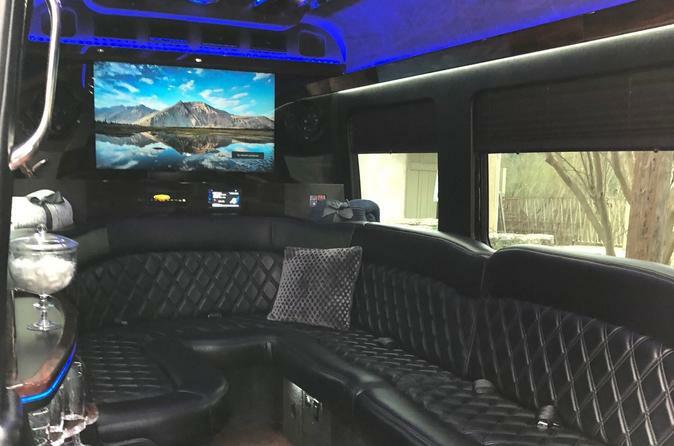 This vehicle is a Black Mercedes Sprinter Limousine and can hold up to 14 passengers however we recommend up to 12 to maximize comfort. Gratuity for great service is not included but is recommended. We are commercially insured and hold an official limo and charter authority with the City of Austin. All of our chauffeurs are professionally licensed with the City of Austin. Complementary bottled water and WIFI in all vehicles. Let our professional chauffeur pick you up in a Large Limousine style Mercedes Sprinter and take you to or from the Austin Airport with in 15 miles. We provide bottled water in our vehicles and if arriving into the air port our driver will meet you inside the terminal in the baggage claim area for your flight. Let us take the stress out of your air travel. Our chauffeurs will monitor your flights arrival and departure and all local traffic to ensure you arrive on time, relaxed, and safe. Complementary bottled water will be provided for all travelers in the vehicle and free high speed WIFI so you can work on the go. If you are traveling greater that 15 miles to or from the airport please book our Zone 2 Large Limo (up to 30 miles) Airport Transfer.